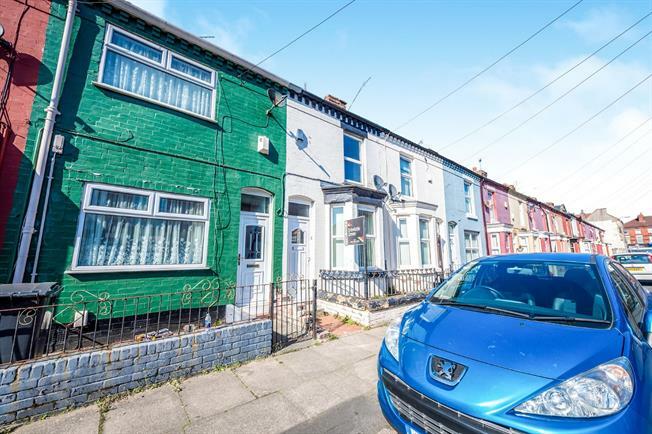 2 Bedroom Terraced House For Sale in Liverpool for Asking Price £60,000. Ideal investment opportunity with great returns. Also great first time buyer property. The property briefly comprises of; entrance hall, open plan lounge, diner and kitchen. Laminate floors through out and a well kept kitchen with combi boiler. To the first floor there are two good sized bedrooms and a family bathroom. Both bedrooms include original fireplaces. Property well maintained through out. UPVC French double glazed door, opening onto the yard. Double aspect double glazed uPVC bay windows facing the front. Gas fire and double radiator, laminate flooring, chimney breast, original coving. Double glazed uPVC bay window facing the rear overlooking the yard. Laminate flooring, original coving. Granite effect and roll top work surfaces, fitted units, single sink, gas oven, gas hob, overhead extractor, space for dishwasher, space for. Double aspect double glazed uPVC bay windows facing the front. Gas fire and double radiator, carpeted flooring, chimney breast, original coving. Double glazed uPVC bay window facing the rear overlooking the yard. Radiator and heated towel rail, laminate flooring, shelving, original coving. Standard WC, roll top bath, electric shower, vanity unit, extractor fan. Double glazed uPVC bay window facing the rear overlooking the yard. Radiator and gas fire, laminate flooring, chimney breast, original coving.